The Bryant Advantage’s CCNA Security (210-260)online video course with hands-on labs. The Bryant Advantage’s CCNA Routing & Switching (200-125) online video course with hands-on labs. *Shown with optional 12U Desktop Rack and brackets; optional cable management option; and optional power bar. SKU: LAB-NA-SS-v2. Category: CCNA Security Lab Kits. Is the CCNA Security certification the right path for your career? With average salaries ranging from $45,000 to $95,000 it just might be. And with the CCNA Security certification you’ll be ready for specialized jobs such as network security specialist, security administrator, and security support engineer. The prerequisite for the CCNA Security certification is to have passed the CCENT (ICBD1 100-105), CCNA R&S or CCIE exam. If you do not have any of those exams passed, don’t worry as this lab kit will also help you pass the CCENT or CCNA R&S exam too. Simulators and emulators provide nothing like a real “hands-on” experience and this lab kit includes what you need to learn and pass the CCNA Security (210-260) exam. The 210-260 test covers topics including knowledge of secure network infrastructure, understanding core security concepts, managing secure access, VPN encryption, firewalls, intrusion prevention, web and email content security, and endpoint security. This exam validates skills for installation, troubleshooting, and monitoring of a secure network to maintain integrity, confidentiality, and availability of data and devices. To start, a Cisco Adaptive Security Appliance ASA-5505 firewall integrates multiple full-featured, high-performance security services, including application-aware firewall, SSL and IPsec VPN, IPS with Global Correlation and guaranteed coverage, antivirus, antispam, antiphishing, and web filtering services. This unit has the BASE license features and it’s own power supply. The CCNA Security Standard Lab Kit includes one 2811 router (with a Enhanced Network Module slot), 4 HWIC/WIC/VWIC/VIC slots, USB, console and AUX ports, 256MB DRAM and 128MB Flash RAM. Two 2801 routers with 2 Fast Ethernet ports, USB, console and AUX ports, 2 HWIC/WIC/VWIC/VIC 2 WIC/VWIC/VIC slots with various configurations, and 256 megabytes DRAM & 64 megabytes of flash RAM. All routers have IOS version 15.1 loaded on them. 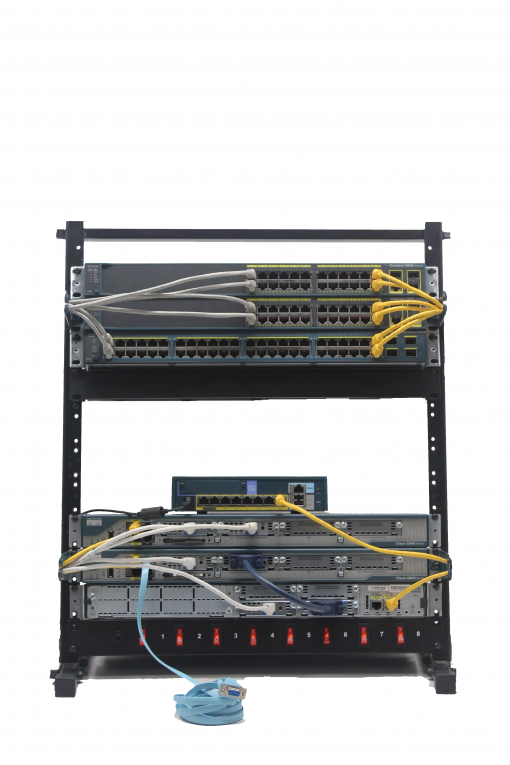 A Cisco 3560PS-Sv2 multi-layer switch is included in the Standard Kit too. The 3560PS-Sv2 is a multi-layer switch including the ability to route data just like a router with the Enhanced Image load; which is our default load. You also get two Cisco 2960TC-L switches running the LanBase image delivering intelligent services such as advanced QoS, rate limiting, security filters, and multicast management to the network edge and basic routing functions. Lots of accessories are also included. A pair of WIC-1T serial cards and four WIC-1DSU-T1-v2 serial cards. This allows you to gain knowledge on both types of serial interfaces. Plus plenty of cables to wire up all those ports in your labs. The CCNA Security Standard Lab Kit includes all the hardware listed and the full CCNA Security online video course presented by CCIE Chris Bryant. This course has lots of “real-world and hands-on” labs for you to learn from. Your copy is fully licensed by TBA and comes with their email support in addition to the free support we provide. *This video is a bit dated but your copy of the course is for the current 210-260 exam. 3560 PS Switch; 100-240VAC auto-switching 3.5A average. ASA 5505 Firewall; 100-240VAC auto-switching 1.5A average.